Di Biase Hair Extensions USA offers a 2 day training certification class to ensure that the future Di Biase hair extensionists receive the proper training needed to apply extensions the correct way. Negative comments about extensions in general are almost always the fault of the technician and not the hair! Some people who have hair extensions may experience patchy bare areas and breakage. This can be caused by the stylist not applying the extensions properly. 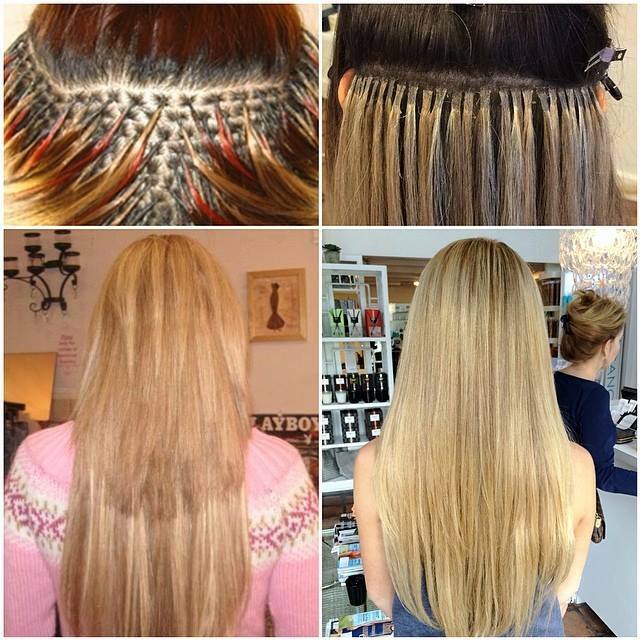 Hair extensions that are too heavy and/or are too tight can cause breakage and hair damage. It is important for the hair extension strand to never be heavier than the weight of the hair you are attaching it to. In addition, the hair used to secure the extension must never be wider than the bond. This can cause too much weight and tension on the hair and cause follicle damage. Di Biase Hair USA is a company that is truly dedicated to doing things the right way. While our affordably priced extensions are top quality remy hair, the bonds are smaller and the hair is lightweight which means less damage to the hair. Hair on the left: Too much tension causing breakage and hair loss.